What does your business card actually say about your business? A few weeks ago I had the pleasure of watching a presentation to my local EO Chapter by Simon Mundell Head of Business Development with RESULTS.com out of New Zealand. Simon shared some interesting material about how companies can operate better to get the results they are striving to achieve. Of all the many things that Simon discusses, one stands out above the others; something so small that most of us tend to overlook its significance. Typically Simon will ask everyone in the group to pull out their business cards and swap with the person next to them. He’ll then ask everyone to look it over on both sides, and see if you can tell what the company does. If you have no idea what the company does, then you tear up the business card and give it back to them. What does it say about us if we can’t even convey to the people we pass our cards out to what it is exactly that our business does? I looked at my card and realized that our tag line “Smart Software. Better Business” was not on the back like it used to be. 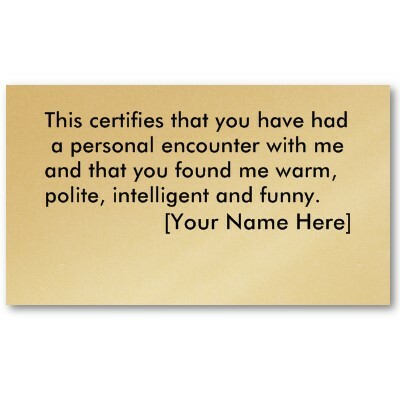 So I, like many others, have been giving out a card that had our name, Efficience, on it but no insight into what we do. If I attend a tradeshow and I have conversation with someone that has interest in working with me, I will give him a business card. He’s likely to remember the service I provide, but probably not my name or my company name. If he goes home with 50 different business cards, how will he know which one is mine if my card doesn’t make it clear? In a few months we’ll be moving and expanding our office. When this happens, we will make sure that all of our new material is clear about who we are and what we do. Is yours?